A Classical Traditional Punjabi dish, a perfect blend of Mustard leaves and spices. 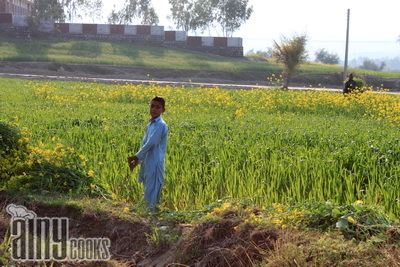 Mustard is grown as an oilseed crop in Pakistan. Mustard Saag is cooked in almost every home in winter season.The budding stems of the crop are used as greens (saag), cooked in villages almost on daily basis. Saag, which apparently looks a free of cost dish, consumes much of the time and other items inevitable for a delicious dish. 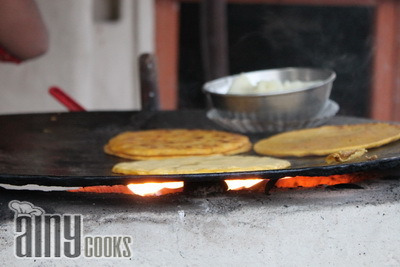 This typically Punjabi dish tastes really nice with Makkai Ki Roti (corn meal flat bread) and a dollop of fresh butter. I always consider myself very fortunate because after marriage i have got a lot of chances to explore my own country . Nature is my inspiration , and the new sights of nature make me rejoice like a child….exploring Punjab region and its rich culture is an amazing experience for me. 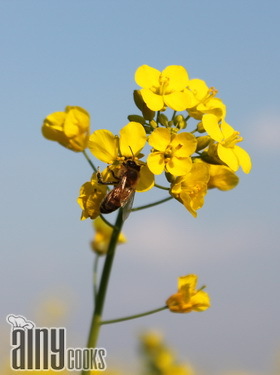 Actually my love to nature and my hubby’s hobby (photography) took us to those beautiful fields of gold, where we all really enjoyed the sights and smell and also had a blast taking pictures! 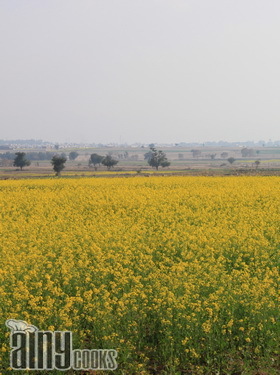 This was actually the very first time that I had been up close to mustard fields. 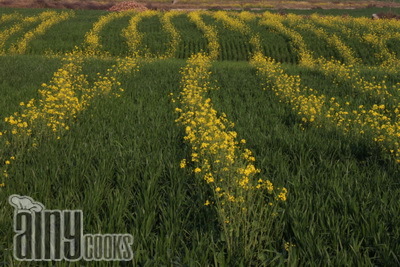 These fields of gold really are a sight to behold! Your entire vision will get completely taken in with all the yellow all around you! 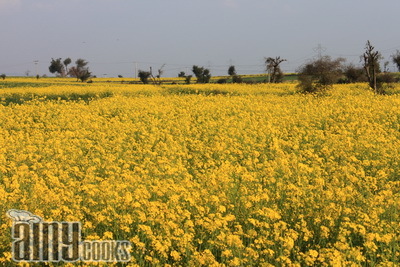 The world around me was covered with yellow mustard fields and I should say that this sight was heavenly.In few fields we saw waves of mustards…lol…. along with green budding crop of wheat. 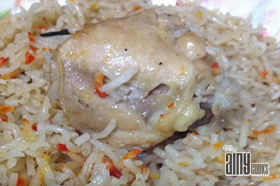 Now come back to the recipe, this recipe is straight from dhabba….. 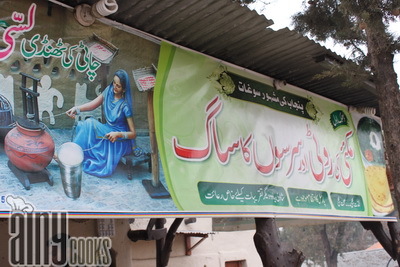 The cook who was the owner told me the recipe thou a bit different from mine but deliciously finger licking …. Wash the leaves of mustard and Spinach and boil in 1/4 cup water till tender ,let it cool down and blend it. In a pot /clay pot add ghee and onion, fry till light golden then add cumin seeds fry for few minutes. Add ginger garlic paste and stir for few seconds then add turmeric,chilli powder and salt ,stir again and add paste of veggie and green chilli. Mix well and after few minutes add maize flour in it.Let it simmer for few minutes and prepare a tempering/ bhagar. In 2 tbsp ghee/butter add chopped garlic 1 tbsp and red chilli flakes 1/2 tsp and fry for few minutes then pour on sag and mix. 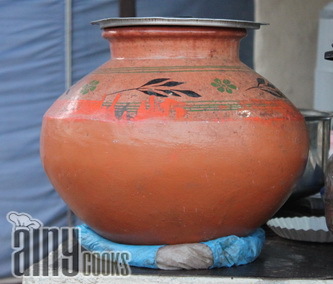 The picture below is of clay pot in which i saw saag on dhabba. Mix salt in flour and knead with warm water,set aside the dough. Make small roties and fry in ghee. I am sending this recipe to (http://www.deenakakaya.com/). and to “Flavours of the world -Grand Finale”. This spinach curry looks so lovely and cooked in the traditional way. 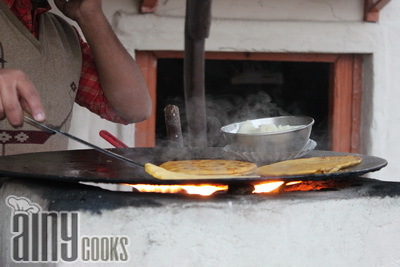 The corn rotis are a great accompaniment. Inviting you to send this Punjabi dish to Flavours of the world grand finale event at simply.food. Thanks for sending these delicious recipes to both events. Any, thanks for sharing these homely, rich, fresh and comforting recipes with fabfusionfoods, they always making me think of the simple and good life. 2 thing of punjab’s famous, 1st laasi 2nd assi.